I received a message the other day from a secret admirer. The following image was attached and it made me automatically laugh. But then I reread it. And reread it. And… reread it…. I have been one of the first people to toss stones at the ridiculous claims that religions make. I LOVE to rip on people in the public eye who try to push these claims with no support or evidence. But this picture made me think for a while about how we (the atheist community in particular, but people in general) approach the people who hold these beliefs as truths. Whether or not the claims of the religion are accurate, the believer holds them to be just as true as gravity, germ theory of disease or evolution are to an adherent of sciences. I’m quickly reminded that we need to be addressing why the belief is wrong, not how stupid the believer is for having the belief. We all have wrong beliefs. Whether its belief in a religious tenet, belief in an incorrect theory, belief in a story you were told from a friend… We have many reasons for holding the beliefs we do. Biases, fallacious reasoning, personal experience, an emotional need for a belief to be true, and indoctrination are just a few of the causes. 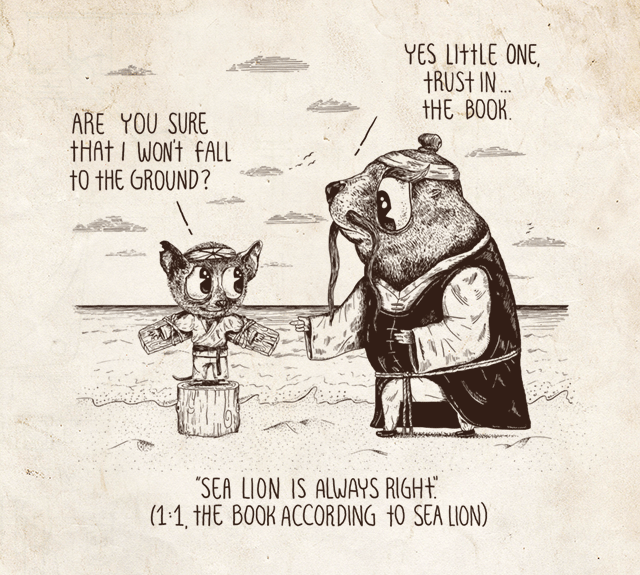 Ali Almossawi published An Illustrated Book of Bad Arguments a little while back and it is PACKED with fantastic explanations of why certain lines of reasoning are fallacious. This may help with arguing against a friend at the bar, in a debate or in a facebook argument but can it help us look at our own individually held misbeliefs? I would like to think so, but putting ones own closely held views on the impartial chopping block of reason is much harder than beheading someone else’s beliefs. To start to understand why smart people believe dumb things we need to go to deeper. This topic deserves a much better treatment than I am able to give it here, but I would like to give you a few resources to start your own research into this fascinating topic. Michael Shermer’s books How We Believe and Why People Believe Weird Things changed the way I look at beliefs. So what do I want you to take away from reading this article? For all of us (yes, me included and almost especially) to keep in mind that belief in a silly idea does not automatically make the believer stupid. Indoctrinated? Uneducated? Maybe. Susceptible to biases? Almost certainly. Understanding WHY someone believes what they do is ultimately more important than WHAT they believe. 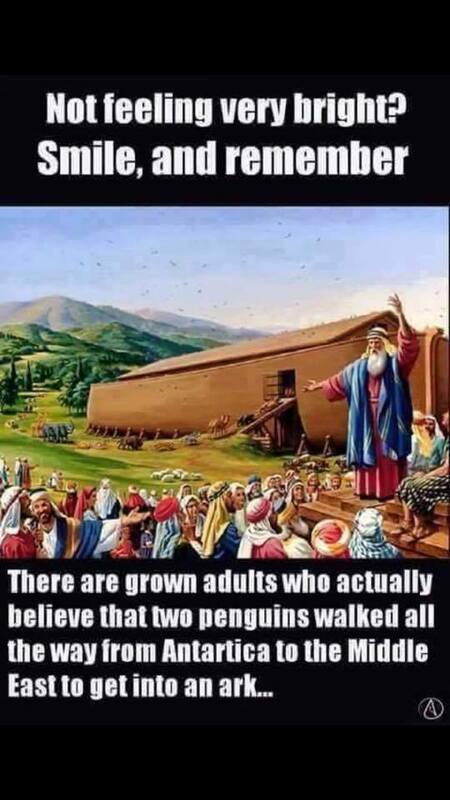 To take the Ark story full circle, belief that an all powerful god could have Pengu and his girlfriend travel thousands of miles to hop a ride on an extremely crowded canoe sounds plausible if you have bad reasons for believing in the god, or the flood story to begin with. Sacrifice all of your trusted beliefs on the alter of logic, reason and evidence and see which ones hold up. Give it a shot, its terrifying, exciting, educating and ultimately freeing.